The Wayne County tax auction is held every fall with the goal of getting blighted or otherwise neglected properties in Detroit, which have fallen into tax or mortgage delinquency, back into the hands of tax-paying homeowners. But many of those homes on the auction block still have people living in them, and some of those people are unaware that the house they’re renting is about to be sold because their landlords didn’t bother to inform them. Michele Oberholtzer, a surveyor of Detroit properties for Loveland Technologies and the Motor City Mapping project, was tired of encountering people who didn’t know their homes were about to be auctioned. 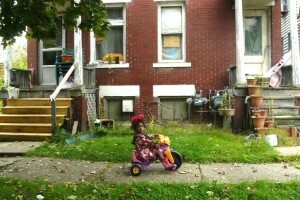 She founded a startup, The Tricycle Collective, to use crowdfunding to help people living in these homes to buy them. The prices for the properties on auction can vary wildly, but tens of thousands advertise a starting bid of just $500. The buyers are responsible for paying all future property taxes. The auction used to be done in person and on paper a few years ago, but now it’s held online. Taking the process digital has helped make order out of chaos, but there are still plenty of Detroit families who fall through the cracks. The most recent auction, which closed at the end of October, listed 24,000 properties that collectively owed roughly $273 million in back taxes. It is estimated by Oberholtzer that 10,000 of these properties were occupied. If that sounds like a lot, wait until next year, when the number could more than double. Complicating the auction process, Oberholtzer says, is the fact that some of the homes available at auction are owned by negligent landlords who not only got behind on taxes, but also didn’t communicate with their tenants, leading to a situation in which auction buyers sometimes snap up properties that are already occupied by a family now facing eviction through no fault of their own. (There are some residents who do receive auction notices—the county starts sending them a year in advance—but there are few options to remedy the situation without money.) Finding the resources to move on short notice is often impossible for the affected residents. In my view, today many families take mortgage loans. But it seems to me that everyone knows that it is difficult to pay back them, that the rates and taxes are very high. In case you faced with mortgage debt as me, you can fill up Internet loan application and get financial help. Once my friend told me that he use online payday loans for paying back his mortgage loan and I decided to try it. However, if you don’t like loans and credits, it will be better for you not to take mortgage loans at all.